Best as I can tell, every man, woman and child in Europe keeps bees. No really, I just can’t get over how every store, every market, every roadside stand is loaded with twenty different kinds of locally produced honey, propolis, beeswax and what have you. Let’s take an example. Yesterday, Michelle and I were getting ready to dunk in Terme Di Petrioloi, some splendid hot springs (or terme, in Italian) a half hour south of Siena when a shabby looking guy comes ambling up to us with a basket full of…you guess it…his own honey and propolis for sale. We laughed and tried to explain in our broken Italian that no, we don’t want to buy any honey because we have our own hives and we are from the United States. He is puzzled because by “broken Italian”, I mostly mean “speaking in simplified English and gesturing”, so I hand him one of our Hive Mind black-and-silver stickers and point back and forth between it and us. He’s excited about the sticker (it’s pretty striking, kind of like a Batman – Dark Knight feel to it, if I do say so myself) and then I notice that the conversation has piqued the interest of the dreadlocked guy standing by a van right across from us. He looks curious about the stickers, so I pull another couple out for him and his girlfriend and try again, by waving back and forth between it and me, to explain that we are beekeepers. Well, wouldn’t you know it, but he’s a beekeeper, too (that’s his card to the left). I know! His partner, Frederica, spoke English well enough to facilitate our conversation, and it turns out that they have 35 hives over on the Adriatic coast of Italy, and have just popped over for a few days to enjoy the terme. They’re sleeping in their van and plan to head back the next day. 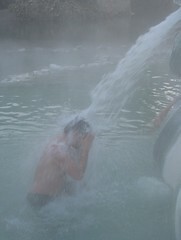 I didn’t get to taste their honey (who brings honey with them to hot springs?) 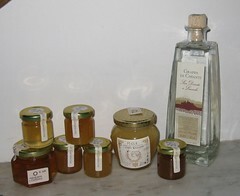 but I did get to taste some their home made grappa, and if that’s anything to go by, I’m sure their honey was splendid. 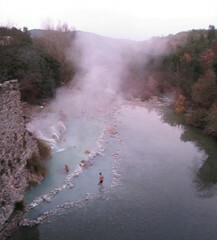 The terme, too, was splendid. 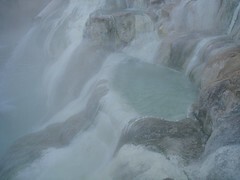 Rushing, clean, hot, hot water with a few different pools deep enough to submerge in. The rock was coated with greenish-white build-up of sulphur and other minerals which was odd to rub, because it had a porcelain-like smoothness to it, but at the same time, had a slightly soft, gripping quality of rubber. The smell was strong, but less like rotten eggs and more like burnt matches. In any case, despite seeing honey everywhere, I’ve resisted buying a bunch to bring back. I’ve only bought about five jars of various kinds of tasting (forest, wildflower, acacia, etc.) and received one jar (with saffron) as a gift from the beekeeper we bought the other small jars from when he found out we were beekeepers, too. The International Brotherhood of the Beekeeper lives!